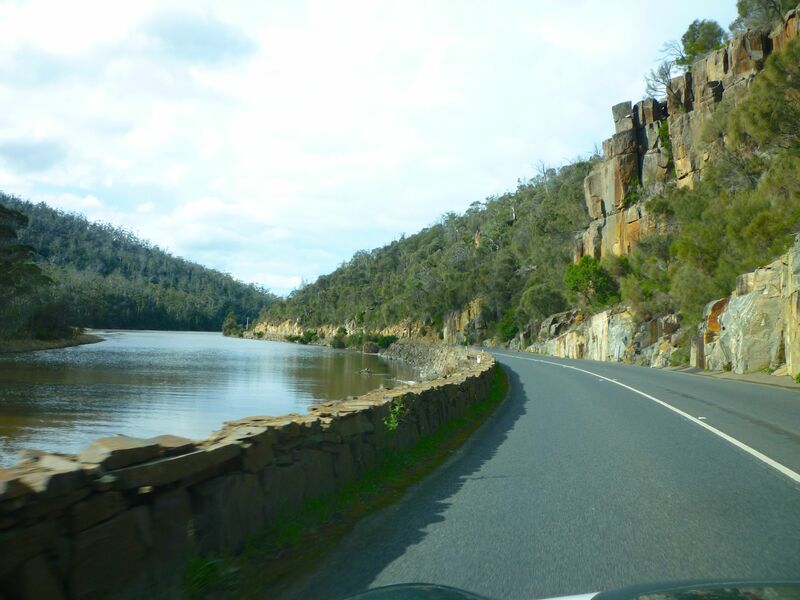 What a lovely drive it is along the A3 between Hobart and Freycinet! I don’t begrudge Stephen the chance to drive his car, but when I imagine how it would be to have a fun car and a guarantee of no cars coming the other way (well, if we were on Top Gear I guess that might be possible!) I’m itching to get behind the wheel! The road follows the Prosser River just before you arrive at Orford; the way the road hugs the side of the cliff is fantastic. Just north of the town, past the golf course, the road passes a beach that is a lovely place to have a pit stop and stretch your legs. 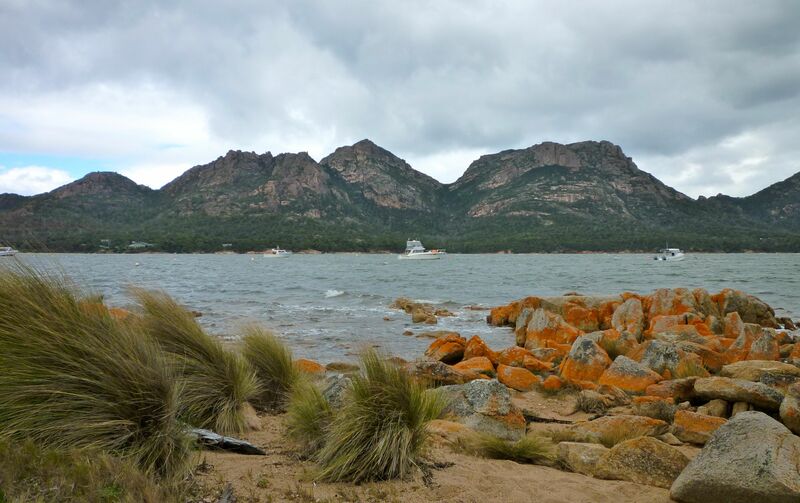 Continue on up the coast to Swansea in Great Oyster Bay – from there you can clearly see the famous pink granite hills (locals might say mountains) known as The Hazards which area iconic feature of Freycinet National Park. You feel so close, but it’s still a fair drive from there because the road doesn’t follow the apparent coast line. There is a lot of marshy swamp land at the top of the bay that the road skirts around. The closest township to Freycinet National Park is Coles Bay; it’s a small place that probably has all of it’s holiday accommodation booked out over summer. 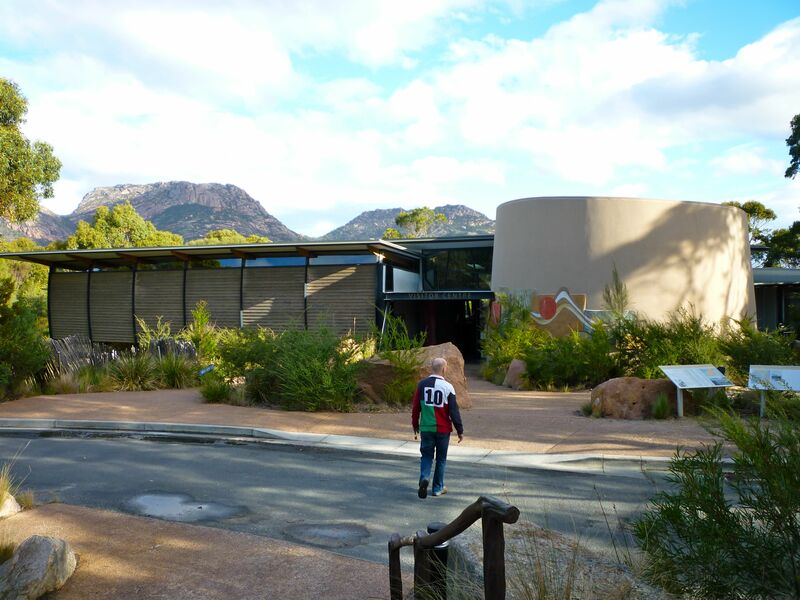 We stayed at Freycinet Lodge which is within the boundary of the National Park. If you haven’t yet bought your National Parks Pass, stop at the visitor centre just as you enter the Park and the staff will help you out. If you’re short on time like we were, a great easy walk is up the Wineglass Bay Track to the lookout over… (can you guess? )…Wineglass Bay! It’s a circuit track; I guess they get a lot of visitors in summer. The track up is beautifully made, but for some reason the track down was a little rougher. Not sure why. Great views over both Wineglass bay and Coles Bay. Part of the Pure Tasmania group, this is the only accommodation within the National Park (although it’s still a short drive to the start of the walking tracks). Not a bad place to stay, but you don’t get to enjoy the view of the mountains as the cabins and main building face west across Coles Bay. Still a lovely view. Our room was comfortable, the lounge area was lovely, and the restaurant was nice, despite the ‘musac’ they have playing all the time. I wouldn’t mind staying there again. Saffire is quite new and by far the most luxurious place to stay (not just in this area, but maybe even in the whole of Tasmania) – and has prices to match. I hear it’s worth stopping at just to have a look around the reception and restaurant – we’ll try to do so next time we’re in the area. Although it’s further from the start of the walking tracks, it does enjoy a beautiful view of the mountains. They also arrange numerous activities for their guests. If you’re planning to head north when leaving Freycinet, I have to confess it’s not an area that we’ve really explored – yet! We drove up to Chain of Lagoons, took the turn off up Elephant’s Pass to St Mary’s (another good drive) and headed west to join up with the Midland Highway (the main road between Hobart and Launceston). Unfortunately we’ve only been along that road once, and haven’t – yet – explored more of the east coast.